Bo Wiley, President of Wiley Automotive Group in Kingman and Bullhead City, Arizona has sold his dealerships to Jason Anderson, President of Anderson Automotive Group in Arizona. We thank both clients for the opportunity to have represented them in this transaction. We wish Bo and his partners an enjoyable retirement, and Jason tremendous continued success on his recent purchase. 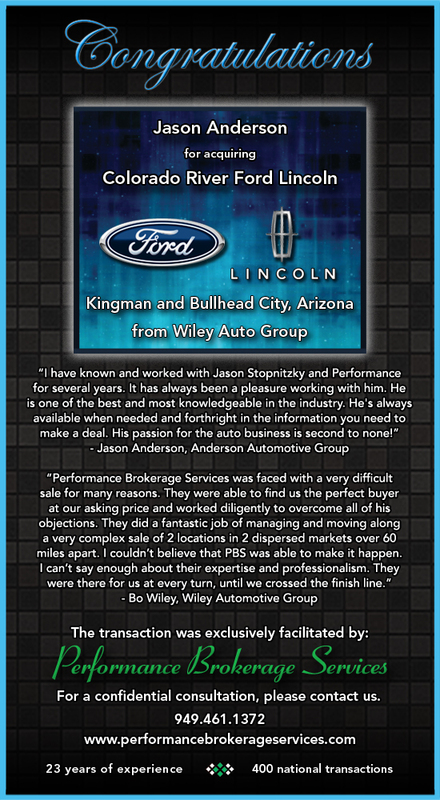 About a year ago I was introduced to Performance Brokerage Services (PBS) by a friend of mine who had an associate in a 20 group use them for the sale of a Toyota Dealership in the Northwest. I was given the Toyota dealer’s name and called him out of the blue. He didn’t know me, but was gracious enough to spend a lot of his time (in retirement) talking to me about how his deal came together and about what great people he worked with at PBS. I took it from there, called these guys, and set up a meeting in Orange County where I laid out all the facts. First of all, at one time I had two successful new Ford Lincoln stores in the Northern Arizona market when the crash of 2008-2009 came along. I made the decision to close the one in the smaller market in order to help drive up sales at the remaining store, which was in a slightly larger market. My thinking was as soon as the market bounced back a little I would reopen the second Ford store. As soon as that occurred I would then try to put them both on the market as I wasn’t getting any younger. Unbeknownst to me, Ford had formulated a policy in Detroit that was dead set against reopening any of the stores that were closed during the depression. By this time “throughput” was a big political buzz word at Ford but it wasn’t working for me. Originally, Ford allowed us to reopen the closed facility, which was by then only 3 years old (40,000 plus square feet with 20 bays – state of the art) in 2010 as a Ford Quick Lane and used car store. Fortunately the market was bouncing back and we were able to get the store back in a mostly break even position with some Fixed Ops revenue and steadily recovering used car sales. However, we weren’t allowed to put the Ford Brand Sign back up or to do warranty work in the Quick Lane operation. By 2012, I thought it was time to ask Ford once again to allow us to reopen the point. I made what I thought was another compelling pitch to Ford, but it fell on deaf ears. I began to realize that as good as the older store was doing, without a Ford brand sign hanging over both locations I would never be able to sell them for enough money to get out of the hole. I continued to bombard Ford with data and statistics supporting the full re-opening of our second Ford second location and even made a presentation to the Dealer Policy Board in 2013. Unfortunately this also fell on deaf ears for purely political reasons. When I first started to talk to any broker about selling out in 2013, at every instance I was met with the same retort that without Ford reopening our second location we had absolutely no chance of selling land, buildings and the single franchise for enough to cover our investment. In fact, I was told most likely the second store could never be sold as a used car lot and Quick Lane. Simply too much invested in it (approximately $7.5M). However, by the time I met the PBS team in 2014, I had finally convinced Ford to let me reopen the second store as a Satellite of the original store. By doing so we could at least get the Ford sign up and begin to regain some of our new vehicle market share that had been decimated. I explained all of this to Performance and they agreed that I had to sell them both as a package to have any shot at paying off all the debt. The problem they faced was that my Satellite agreement was only temporary and in fact had a lot of performance strings attached. PBS was faced with a very difficult conceptual sale for us because we also wanted ALL THE MONEY and were unwilling to entertain any “skinny” offers as by then both stores were back in the black. By the time 2015 rolled around both stores were once again performing successfully. I had put together an extremely aggressive proforma for 2015 for PBS that I wanted them to sell from. At first they didn’t seem to believe that we could get our asking price, but as the months in 2015 started to stack up and we met or exceeded our proforma projections each month, they became believers. They were able to find us the perfect buyer at our asking price and worked diligently with the buyer to overcome all his objections with respect to the Satellite issue, fixed assets, appraisal values on Real Estate, etc… They did a fantastic job of managing and moving along a very complex sale of two locations in two dispersed markets over 60 miles apart. We closed this sale on January 8, 2016 and I could not believe that PBS was able to make it happen. I can’t say enough about their expertise and professionalism. They were there for us at every turn in the road until we crossed the finish line.